CONDEMN THE ARREST OF THUSHAR NIRMAL SARATHY, SECRETARY, KERALA CHAPTER, CRPP AND JAISON COOPER, PEOPLE’S ACTIVIST, BY THE KERALA POLICE! RELEASE THUSHAR SARATHY AND JAISON COOPER IMMEDIATELY, UNCONDITIONALLY! Friday, the 30th January turned out to be a day when the Kerala state machinery and its lawless police brazenly demonstrated yet again that they can’t for once uphold the law of the land while dealing with political dissent of any nature. If post-1947 India have demonstrated that successive governments at the centre or the states used its police and the state machinery for targeting political rivals from different political combinations of the day, it is incriminating to note that all the governments that occupied power throughout the last 68 years have been unequivocal in maintaining the state of permanent emergency for tackling political dissent of the people! 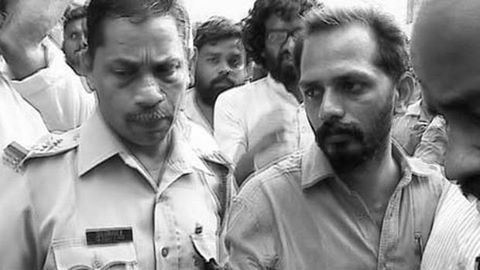 On the 30 January 2015, the Kerala police and the special branch arrested Jaison Cooper in Ernakulam from his work place and Adv. Thushar Nirmal Sarathy from Calicut while he was addressing the press about a protest programme to be held there the following day against the increasing violations of the fundamental rights of the people in the state. At the same time, the police raided the residences of Thushar Sarathy, Advocate Manuel Joseph who is a people’s activist, Ms. Jolly Chirayath, convener of the Women’s Collective, and a artist activist. From the residence of Thushar Sarathy the police took away several case files without even bothering to record the list of the ‘seizures’ that they have done. Even the search was conducted without any warrant being shown to the custodians of the residences. As increasing instances of impunity have become the hallmark of the police and investigating agencies in the Indian subcontinent with the Kerala police refusing to be different, one can only foresee a motivated police out to incriminate, frame, those who are critically looking at the policies of the government. For the police, the fundamental freedoms enshrined in the constitution of the largest democracy seemed to, for every practical purpose, remain in permanent suspension, all in the name of ‘national interest’, ‘national security’ and last but not the least, that weapon of mass destruction—‘development’. The preparations for the vilification and then framing of civil rights activists, public intellectuals and people’s activists had been laid well in advance in Kerala with a so-called ‘look out’ notice issued purportedly by the police with photographs of most of the prominent civil rights activists and people’s activists published in it. Adv. Thushar Sarathy’s name was also there along with other prominent civil libertarians from the state who were alleged to be working for or in the interest of a proscribed organization the CPI (Maoist). When there was a public outcry against this as a deliberate attempt on the side of the state to clamp down on people’s movements, the police and the administration including the home ministry went on a defensive mode neither denying nor accepting the veracity of such a notice. But by then the media vilification of such activists had already begun making the grounds ready for the witch hunt. That this is nothing less than a witch hunt of those standing in favour of the poorest, deprived and discriminated majority is evident from the statements of the police officials as they make heavy weather of the literature ‘seized’ from the residence of Thushar. The most fascist way of incriminating someone is for his/her thoughts and the Kerala police make no bones about the fact that Thushar uses the literature to spread the ideas of the CPI (Maoist) which is a proscribed organization. Needless to say that Adv. Thushar Sarathy has been charged under Sections 10 and 13 of the draconian Unlawful Activities Prevention Act while Jaison Cooper has been put under Section 13b of the same. It is being reported that Jaison Cooper has been put in police custody for the next 6 days. That Thushar has been quite vocal about the rights of the labourers, adivasis, Muslims and other deprived and discriminated sections makes him the most sought after target as this government in Kerala or for that matter the Narendra Modi led government in Delhi are one when it comes to turning their back against the interests of the people. Apart from being the secretary of the Kerala chapter of CRPP he is also the secretary of the Janakiya Manushyavakasha Prasthanam (People’s Human Rights Forum). Jaison Cooper is a prominent blogger and also a people’s activist who has been vocal about the rights of the people. Civil rights activists being the conscience of the society as they mirror in their acts of solidarities the anguish and concerns of the vast sections of the masses that has to be silenced at any cost for the powers that be in their forward march to open up the resources and wealth of the people in the interests of private capital. Development in the age of globalization, liberalization and privatization has become a question of ‘national interest’ though it is increasingly becoming clear that this is nothing but interests of the big corporations—domestic and international. Development has become a question of law and order. Those who talk against this model of development are anti-nationals. And hence are a subject of law and order. That many of the issues raised by Adv. Thushar and Jaison are also questions to safeguard the rights guaranteed in the constitution of India doesn’t matter as long as they come against the interests of private capital—domestic and international. It is important that all democratically inclined people of the subcontinent raise their voice against the penalization of dissent and aspirations of the people. It is important that we all join hands and demand the immediate and unconditional release of Jaison Cooper and Thushar Nirmal Sarathy here and now! We need to be in vigil to safeguard the rights of the incarcerated to be not tortured or their right to silence be not violated as the police will force confessions on them. We need to condemn the brazen attitude of the state which brutalizes the lives of people’s activists by subjecting them to the inhuman treatment of laying siege to their places of stay under the garb of search without even a search warrant. We should demand stringent action against such police officials who are always ready to throttle the basic rights of the people all in the name of security. Are we living in a democratic dictatorship? ‘Democratic dictatorship’ is a much debated concept in Kerala. I am referring not to that here but to the dictatorship of the executive led by democratically-elected politicians. Recent incidents seem to indicate that this is now an ever-growing tendency in our democracy. A few months back, a notice with the photos of well-known public figures, which identified them as Maoists, appeared in the Mananthavady police station at Wayanad. These were pictures of senior, very well-known activists who have fought battles for democracy in Kerala. Following widespread protests, the police was forced to remove the notice. On 28th July this year, Jonathan Baud, a Swiss citizen was arrested by Valappad police for attending a commemoration meeting of a Maoist leader, Sinoj, who died in an accidental explosion at the forested Kerala- Karnataka border. Mr Baud was in India on a tourist visa. His arrest was big news in the media which had happily swallowed policespeak, and so he was also projected as a Maoist. The reports claimed that he had come here with the express purpose of attending the meeting, and that he delivered a solidarity speech there. Later, when the Commemoration Committee made public its own version of events, the police sensationalism was refuted and had to be withdrawn. The charge against Mr Baud are apparently limited to violation of visa conditions and it was admitted that he had no Maoist links. The latest in the series of such incidents involves a young woman, Aradhana, an empaneled casual artist of the Kochi FM radio of Akashavani. She was one of the producers of Samakalikam, a programme based on current affairs. A team of officials from the Kochi office of the National Investigation Agency seized tapes of Samaklikam produced by Aradhana and broadcast by the Kochi Unit of the All India Radio for suspected ‘subversive messages’ supporting Maoists. She was questioned by NIA for nearly two hours in connection with the incident. The All India Radio does have a competent team of editorial staff to monitor and select the news items, especially linked with news and current affairs, and the finalization of these happens before broadcast. The news and current affairs programme broadcast by the AIR, it is well-known, stays well-within acceptable limits set by authorities. Even in the dark days of Emergency, media persons were not hounded by the security agencies on a retrospective basis as has happened in the case of Ms Aradhana.A police team snooping on a news item broadcasted after due clearance by a competent editorial team appointed for the purpose goes against the very fundamental tenets of media freedom. NIA has the power only to investigate crimes coming under UAPA and no case,not even a petty case, is pending against Aradhana. The fact being so, this action is a clear violation fundamental rights enshrined in our Constitution. These incidents are the outcome of a Maoist phobia deliberately spread by the state in the name of fighting Maoists. From the very beginning itself India has been an integral part of the so-called global war on terrorism. It is a new kind of war where the enemy is not another nation but militant groups or organizations. These are, by now, well-known facts. Now, who is this enemy? To this question, it appears, many answers are possible. The answer is decided purely on the basis of subjective assessment by different authorities. In other words it is purely left with the state to decide who the enemy is and how the threat should be dealt with. No wonder, plenty of space is thrown open for all sorts of excesses by the executive. The temporary measures taken at the time of war such as large- scale spying, arrests, torture, violation of fundamental rights, special powers to the armed forces and police are now became permanent features of our democracy. It is in these situations such incidents are happening. The judiciary and legislature are least concerned about these excesses. Increasingly, democracy is being hollowed out and made into a superficial shell while we move implicitly towards everyday dictatorship of state carried out through state agencies, which creates an order that benefits the new globalizing elites, and reinstates Brahminism as the dominant value system. ruling class whose world outlook and value system is based in Brahminism . The mass resistance to this lies somewhere ahead in time, perhaps, but until then, it seems, we will see episode after episode in the hollowing of democracy in Kerala and India. We cannot close our eyes to the fact that for all the talk of Kerala’s ‘vibrant public sphere’, we still seem quite unmindful of creeping dictatorship that promises to undermine our actually-existing democracy.